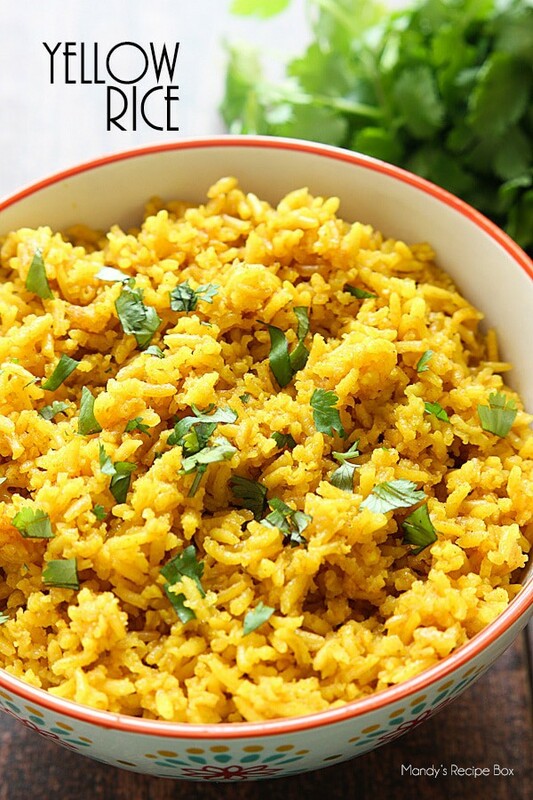 This Yellow Rice is a great side dish for most any meal. It’s also delicious in casseroles. Made from scratch and your whole family will love it! What’s up, you guys?! Mandy from Mandy’s Recipe Box here. Who is ready for Christmas time? Who is ready for the chaotic times ahead? Who is ready for the non-stop hustle and bustle? Not me. I am all about Christmas. It’s my favorite time of the year. BUT. I hate the crazy busy time it brings. I just want to sit on my comfy couch with my heated blanket, a book, and Diet Coke. All month long. Is that too much to ask? In between the running around from one school Christmas program to another and parties and shopping, I need easy meals and side dishes. 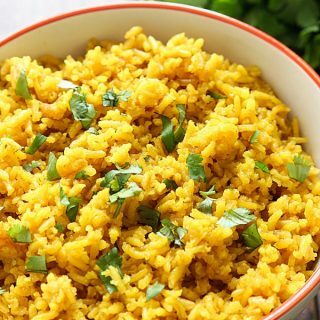 This Yellow Rice is made from scratch and can be used in my Cheesy Rice and Chicken Casserole if you don’t want to use or can’t find the packaged kind. Give it a try! 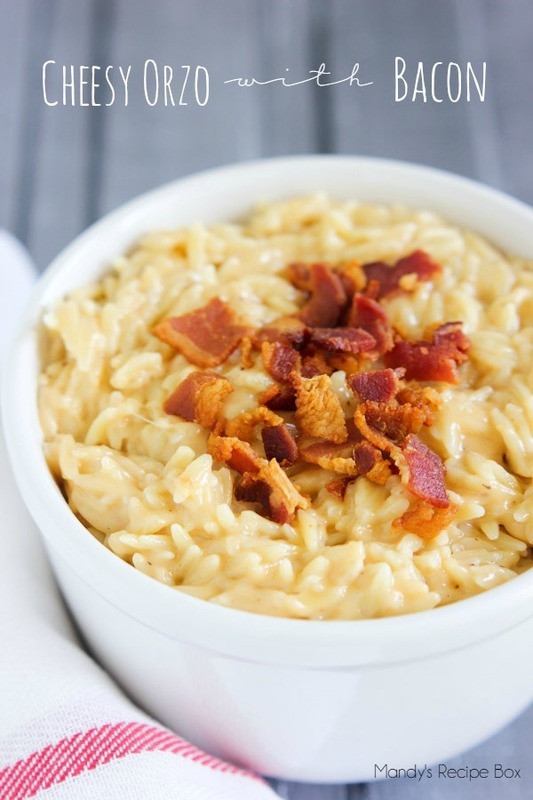 It’s a great recipe to have on hand for an easy side dish. Add the rice, stirring until rice begins to lightly brown. Add garlic, onion powder, and turmeric and stir until well combined. Slowly stir in chicken broth and raise heat to medium-high. Add salt to taste. Bring the mix to a boil and turn heat to low. Cover with a lid. Simmer for 20 to 25 minutes. Remove from heat and add cilantro. Fluff with a fork. Isn’t Mandy amazing?! We freaking love her! Also, if you need a delicious main dish to go with these amazing sides you HAVE to check out our Classic Chicken Schnitzel! It is unbelievably good! omg! 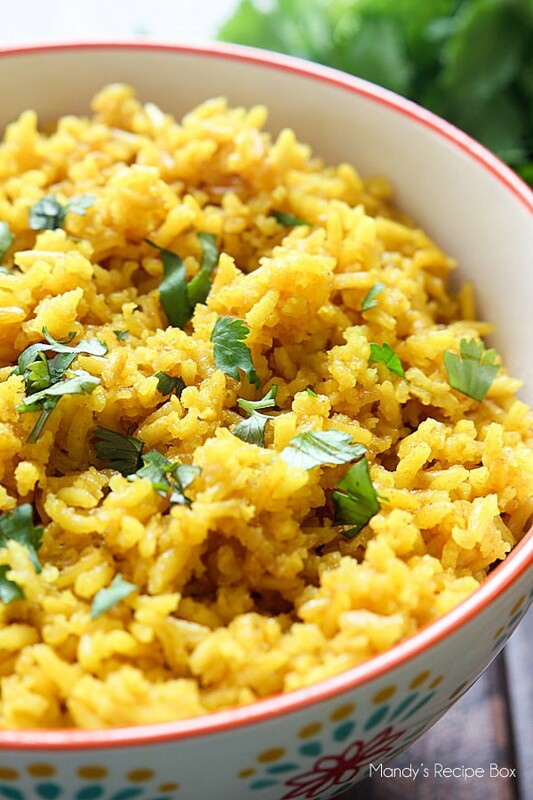 this rice is soooo good, paired it with a cuban steak recipe and squeezed a little lime on top. Yay! So glad you loved it, thanks so much for letting us know!